Now, on to the survivor. This is more than just a City Survivor, it's an Everything Survivor. Seriously, this is a convertible for the apocalypse. 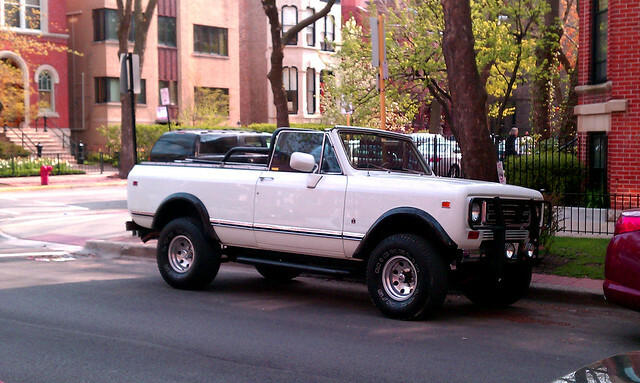 Pictured above is a Scout II, International Harvester's attempt to get a slice of the 4x4 pie. The spartan design of the Scout II means that the only clue to model year is the grille design. By my research, this one dates to sometime between 1977 and 1979. Developed in years following World War II, International's Scout stands alongside the Willys Jeep and the Land Rover Defender to represent the genesis of the modern SUV. Made in Fort Wayne, Indiana, from 1961 to 1980, the Scout and Scout II enjoyed a production run of over a half-million units and considerable success in off-road races like the Baja 1000. Despite production numbers, these capable off-roaders have largely vanished from the roadways. It could be that the Scout is a victim of its own capabilities - a sturdy, reliable truck rarely sees an easy life. In any case, this one is in amazing condition. Flat sides are a magnet for dents, but even the stainless trim is unblemished. The stout tires and brush guard work well with the factory rollbar to enhance the Scout's all-terrain credentials. Spring is here, and with recent flooding around the Midwest, this Scout makes for a great convertible that can also ford a stream.